The bill aims to allow craft brewers sell their beer to visitors on their premises. TD MICK WALLACE told an Oireachtas Committee today that it’s just not possible for visitors of breweries to drink as much craft beer as they would commercial beer. He made his comments in support of the Labour Party’s Intoxicating Liquor (Breweries and Distilleries) Bill 2016. 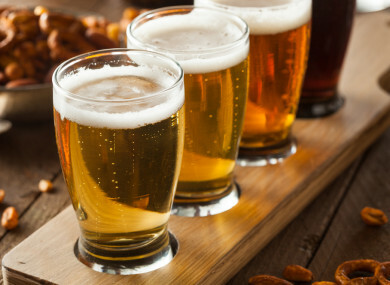 The bill aims to allow craft brewers sell their beer to visitors on their premises, something they are currently prohibited from doing under Ireland’s licensing laws. It will allow the Revenue Commissioners approve a licence for sale of alcohol at craft breweries and distilleries between 10am and 6pm, with the sale of liquor to visitors confined to those who have participated in and completed a tour of the premises. Wallace tabled a number of amendments, which included adding wine-makers to the bill, as well as extending the licensing hours to 7pm. Justice Minister Charlie Flanagan said the government is very supportive of the measures, but is wary that Wallace’s amendments could change the spirit it was intended. He said the restricted nature of the sale of beer on the premise is based on the idea of the “beer tourist”. Flanagan said the bill is very much hinged on the idea of the beer tasting event, and was reluctant to move towards a “more consumption oriented experience” after the guided tour. He said a brewery tour could take a short time, adding that the whole experience is based on the tasting of the craft beer. The Wexford TD (who told the committee he had a vested interest in the topic as his son is opening a brewery) jokingly said he did not want to get into a discussion on how much beer each TD and senator can put away, but reiterated his point to the minister that “you would not drink half the amount of craft beer of what you would beer in the pub, it is a different product”. Labour’s Alan Kelly, who introduced the bill, said he would agree with Wallace. Kelly said the legislation would bring craft breweries into line with the rest of the world. “Can you imagine if you were in Spain, Italy, France or the west coast of United States visiting vineyards and you weren’t able to purchase the product there,” said Kelly. “This is the exact anomaly in the law that is holding the microbrewery industry back,” said the Tipperary TD, who said it needed to be changed. Email “Wallace tells minister: 'It's not possible for brewery visitors to drink as much craft beer as commercial beer'”. Feedback on “Wallace tells minister: 'It's not possible for brewery visitors to drink as much craft beer as commercial beer'”.